South Korean discount chain E-mart delivered the mini electric vehicle sold at its stores to its first buyer at its Seongsu branch on Tuesday. The D2 mini electric vehicle sold at E-mart is manufactured by Chinese carmaker Zhidou. Zhidou’s two-seater electric car can run up to 150 kilometers on a single charge. 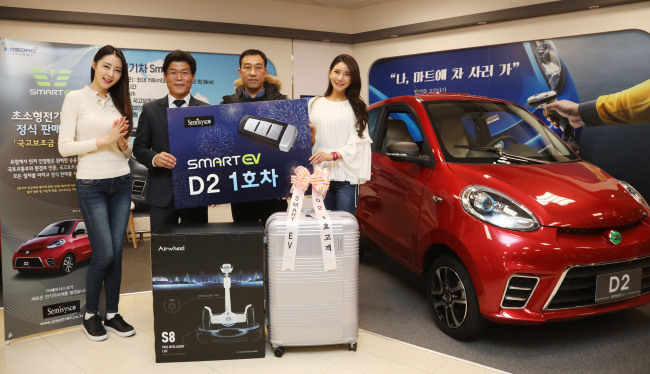 The D2 is priced at 14.5 million won ($13,480), which was fixed in December after being approved by regulatory authorities as well as local governments’ subsidy program of up to 5 million won. E-mart currently sells the mini electric vehicle at M Lounge, a selected shop for the retailer’s e-mobility lineup, at 11 stores across the country including those in Yeongdeungpo and Hanam.